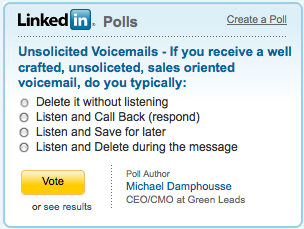 I know my colleagues in the sales consulting industry are going to fill this page with comments telling me why their Lead Gen Tip of the day would be to craft the perfect voicemail script. My response is -- Don't Bother. What do you think? Leave one or Don't? This past week on Focus.com, there was an active discussion regarding if we Should or Should Not leave a voicemail when tele prospecting. The opinions are varied, but for those of us in the business, I thought we should put some stats behind the argument. Hence, time for a LinkedIn Poll. I've setup a non-targeted poll, below, and I've also paid for a random C/VP targeted poll. The results will be interesting. Clicking on the graphic below will bring you to LinkedIn to vote.